Painting has always given a feeling of safety, comfort and self-expression for Gail Ann Bourgeois. Bourgeois first began painting roughly three decades ago in grade school but grew up watching her father paint. “It’s my way of self-expression,” Bourgeois said. “It’s something that feels good, it brings spiritual closeness,” she said. Bourgeois has always surrounded herself with artists and has learnt a lot from being around them. “The more people you paint with the better you get,” she said. 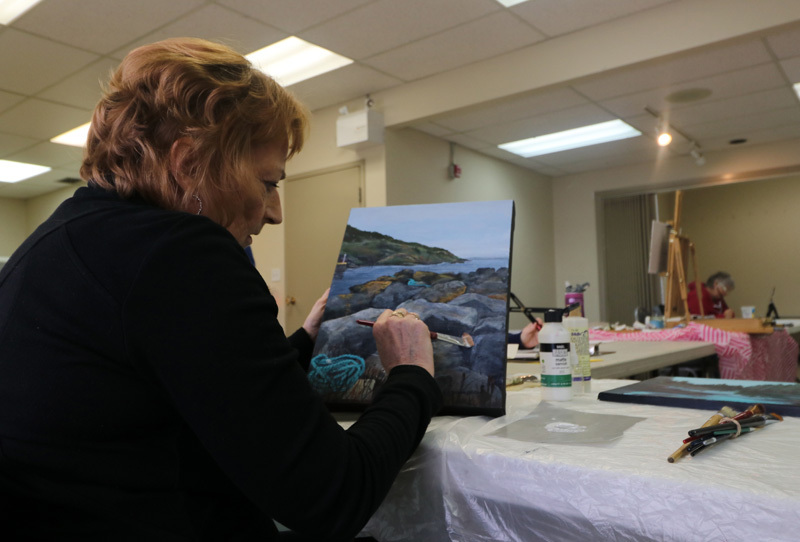 Throughout the years of attending workshops and classes, Bourgeois has learned how to work with acrylic paint, oil paint, multi medium with plaster, and water colours. Although Bourgeois enjoys using a variety of materials to create art, she will only use acrylic paint when attending the weekly Chestermere Fine Art Guild meetings, because the pieces are easier to transport. “I don’t like transporting wet paints. It will inevitably get smudged or I’ll be wearing it on my clothes,” Bourgeois said. She added, the last time she tried to transport an oil painting, a wind gust blew the canvas up, hitting her, and transferring the wet paint onto her clothing. Bourgeois added, she used to do other forms of art, but found that painting animals and birds of prey was more intense, and more fulfilling. “The process begins with thinking about it for a long time,” she said. There have been scenes that Bourgeois has passed during times she’s traveled that have stuck in her head, that bothered her until she painted it. “A lot of it comes from memory, places I’ve been a long time ago that stay in my head, they need to be released,” she said. “It’s relaxing, you go into your own world when you start a painting. “The biggest thing is you get to express yourself, and a lot of things that you keep inside come out into painting after, and it shows,” she added. Lately, Bourgeois has been using canvases with a two-inch depth and begins with painting the edges black which keeps uniformity when the painting is hung on the wall. Then she undercoats the canvas to block out any white that could potentially show through. Bourgeois graphs out anything that she sketches for a painting to ensure the animal or bird is realistic. “I have to graph it out because of my eyesight, I have astigmatism. In order for it to look like what I’m looking at, and not erasing 20 times,” Bourgeois said. Once the sketch is transferred to the canvas, Bourgeois looks for a suitable undertone and begins mixing colours. “I do the entire animal in that colour, and then layer lighter colours on top where the sun hits,” Bourgeois said. Although Bourgeois finds comfort in painting, creating art has not always been easy for her. Bourgeois had an operation to correct carpal tunnel in both hands, and during her recovery she missed painting so much that she taped a paintbrush to her hand. “I couldn’t grasp it, it went flying all the time. “I got around it, I tried painting with my left hand, they weren’t as good. When the right hand was healing, it was hard to not paint, so I found a way to do it,” Bourgeois said. Despite the setback, Bourgeois tries to paint daily. She added, “I like to paint late at night, it just seems to be the time that it’s peaceful.